Last weekend was a crazy busy weekend for me. I was hosting a Halloween party on Saturday and then also catering my work lunch on Monday; which meant that I spent Friday night until Sunday late afternoon in my kitchen. It’s times like those that I’m glad we’re in an apartment because after all of the work it was rather nice to just take 20 or so steps to the bedroom and collapse into bed. I can’t even imagine if I had to walk up a flight of steps or something. 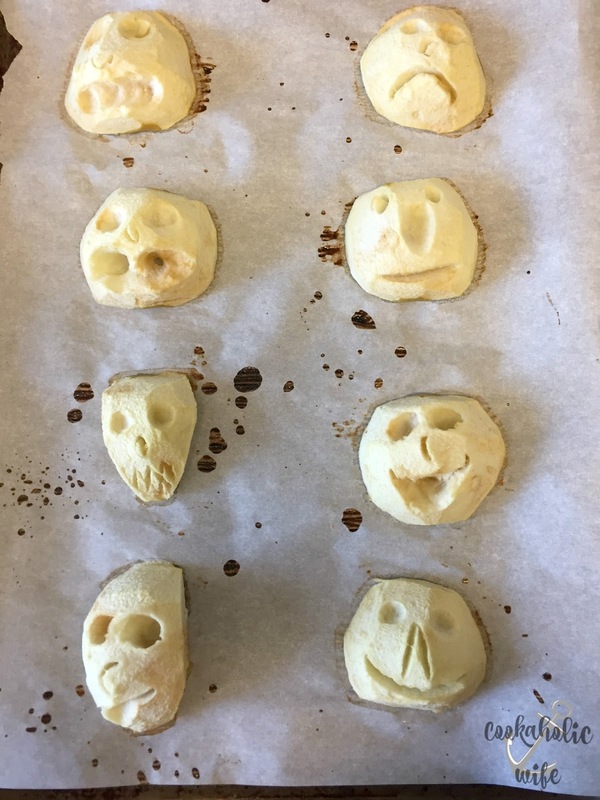 I saw this recipe on Pinterest and knew I needed to make it for my Halloween party. It’s equal parts creepy and delicious. I had no idea you could do this with apples and now I think it’s going to become a Halloween party classic. 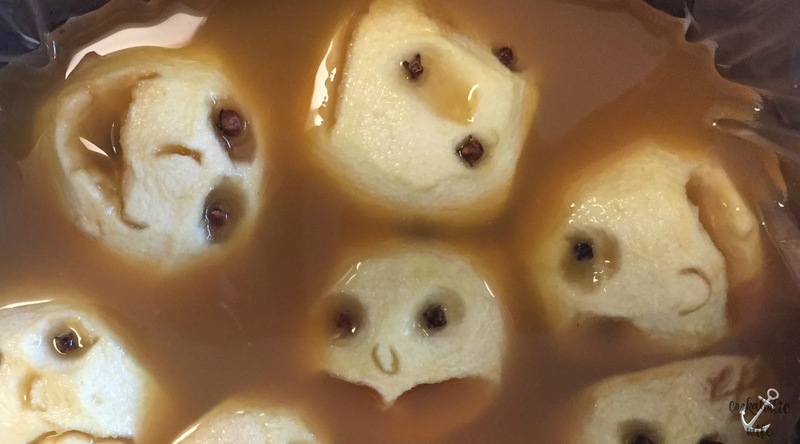 Apples are peeled and carved to look like faces before being added to apple cider, making this a spooky drink great for a Halloween party. 2. Peel the apples and slice in half. Remove the seeds and the core. 3. 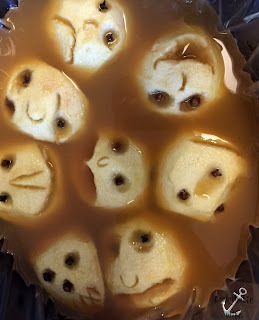 Use a melon baller, vegetable peeler and/or paring knife to carve faces into the apples. 4. Place apple faces onto a baking sheet lined with parchment paper. Squeeze lemon juice on top. 5. Bake for 90 minutes. Remove from the oven and press the cloves into the eye sockets. 6. In a slow cooker, pour the apple cider and lemonade concentrate. Add the apples and turn to keep warm. 7. To serve, pour into glasses and optionally stir in spiced rum, whiskey or bourbon. If you aren’t sure how to carve the faces, you can check out the link to Martha’s website and there is a video showing you, but its pretty easy. You could also easy add in the liquor while it is warming up in the slow cooker, but I’m not a fan of “cooking” alcohol like that.